There is growing trouble in the global bond markets. US 10 year treasury yields have spiked to as much as 2.59%. This is causing many pundits at the Davos World Economic Forum to begin warning of a future market crash and an end to the 34 year rally in bounds. The IMF is warning that over leverage in emerging markets could cause a financial crisis as the pool of offshore cheap US dollars dries up and borrowing rates start to rise. While this is certainly a concern it is worth noting that the same people have been making the same predictions for some time. In 2013 we saw the Taper Tantrum which was caused by expectation of tightening from the Fed. In the end the Fed pulled back from tightening to give countries like China more time to get their finances in order. India has recently recapitalised its banking system to cover bad debts and China has stated at Davos that no Chinese Bank will be allowed to fail under any circumstances. The Republican tax cuts in the US are likely to exacerbate the situation for two reasons, firstly companies like Apple with large offshore holdings of US dollars will now be returning these to the USA. Secondly, cutting taxes just at the point the US reaches full employment will boost inflation. As the Fed steps in to raise rates at the same time it is cutting QE then we will see a significant increase in the cost of offshore US borrowing costs. However this scenario now has been around for at least the last 5 years and governments and companies are now much better prepared than they were. 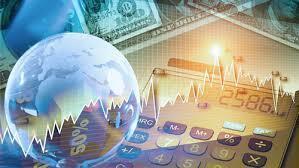 For the time being it is better to stay in shorter dated inflation linked bonds staying underweight in bonds overall. Equity growth should remain strong until at least the end of the year and it is better to use Gold to hedge out against uncertainty than bonds in the current climate. Bit coin prices have dropped by almost half since the end of December. Prices appear to have stabilised in the $10,000 – $11,000 range after spiking as high as $19,000 at the end of December. However the current Bit Coin Chart as you will see below looks to show the classic signs of the bust that follows any mania. If Bit Coin prices continue to fall in the classic mania phase then prices could reach between $600 and $1000 in the next 12 to 18 months. However those that believe in the future of crypto currency believe strongly at they are likely to be able to support process in the $3000-$5000 range. 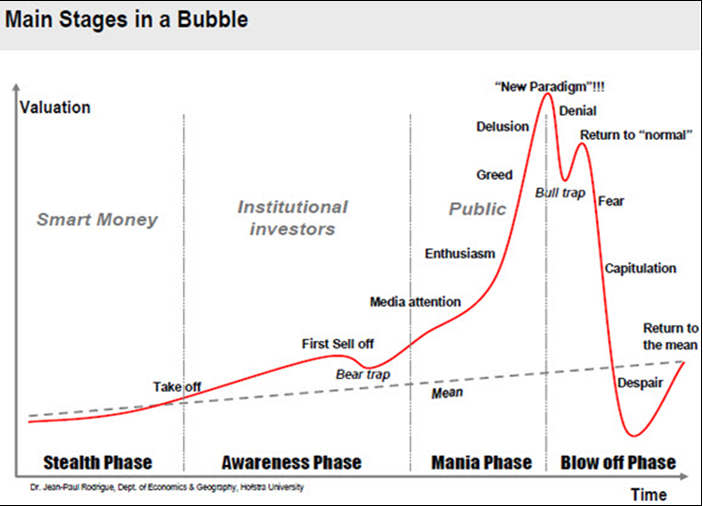 We may have seen the ‘dead cat bounce phase’ of the standard bubble in late December early January or the Current stabilisation may be the start of the phase with prices moving up to $14,000 – $16,000 as people buy on the dip. So, that would only seem likely if there was some positive news flow to come out which seems unlikely. Governments from South Korean and China to France and Germany have all begun moves to either ban or heavily regulate Cryptocurrency. Once the US and the UK follow suit then prices will begin to fall again. It would seem wise to take profit from Crypto currency just now and wait and see if any currency emerges dominant after the fall over the next 12 months before moving back in. Frances President Macron’s visit to the UK has seen the pound move up as high at $1.40, a post Brexit high. Warm words from the French leader and a feeling that a softer Brexit may be at hand have caused the bound to rise. Strong employment figures in the UK as well as high inflation also make it seem likely that the BOE will continue to raise rates. Moving forward the Euro may have some issues around the Italian elections which may further boost the appeal of the pound. It seems likely that the pound will continue to rise in the $1.50 range over the next year however if no deals are done before the end of 2018 it could experience significant volatility.